This Sunday, we celebrate an overlooked, but wonderful holiday – National Grandparents Day. Celebrated on the first Sunday after Labor Day, the holiday was created to remind grandchildren to tap into the wisdom and heritage their grandparents provide. Many of us are separated from grandparents or grandchildren, and it’s difficult to keep the lines of communication open. I am so thankful for the relationship that our children have with their grandparents, but it requires commitment and intentionality from both sides to nurture those long term relationships. Busy schedules, and distances often get in the way of nurturing these times together, but don’t let “best intentions” rob the opportunity we have to honor the grandparents still in your life. By taking just a few minutes to reach out, you will bless them in ways never imagined. For some, this may be an emotional decision, but even one small phone call can speak volumes and mend bridges that may, or may not, be unintentional. Celebrate the holiday this weekend with some of these simple ideas and traditions that your children can do with their grandparents. One is to complete a grandparent interview with a variety of questions. What were your parents like? Describe your childhood? What were your goals and aspirations? What advice do you want to pass onto your children and grandchildren? This will give your children a chance to see how the world has changed since their grandparents were young, plus give your parents an opportunity to share stories. Capture this on video and you will have a priceless family keepsake that will be enjoyed for generations to come. We have had some wonderful opportunities to do this over the last few years, and it’s been such an incredibly meaningful time. I outlined a special time in my “Do you know your family story?” post. Favorite Things to Do – Start a new tradition for Grandparent’s Day by taking photos of the grandchildren doing something Grandpa and/or Grandma love to do (gardening, playing cards, golfing, baking pies, dancing, etc.). Take that same photo every year, and keep them in chronological order in a Grandparent’s Day photo album. This will become a favorite tradition everyone looks forward to and a wonderful way to build a legacy of love. Promises to Grandma and Grandpa – Find a glass or plastic jar and have your children decorate it with construction paper and stickers, or a strip of fabric/leather. Then, have each child write on pieces of construction paper some things they could help their grandparent’s do in the upcoming weeks: “I will help you rake the leaves” or “I will help you clean up the garage.” Give the rewards jar to them as a gift on Grandparent’s Day. This teaches children the virtue of helping others, which is sometimes the most valuable gift of all. If you are close by, it might be as simple as sharing a container of your favorite frozen cookie dough and attaching a note with a running list of all the “sweet” things they have done. Do you have Grandparents still in your Life? Honestly, this is a day that often sneaks by me, but prioritizing it is my desire. One never knows how much time we have left to cherish these multigenerational times together. (Last Friday, after our son’s football game, both grandfathers were together for the first time in years and years. I love those special photos with grandparents from both sides!! Thanks for the reminder about Grandparents Day! My grandmother has been a huge influence in my life. My mom has been an extra special grandparent to my son this year. I want to make sure I do something great for the two of them this year for Grandparents Day. Thanks for the reminder! 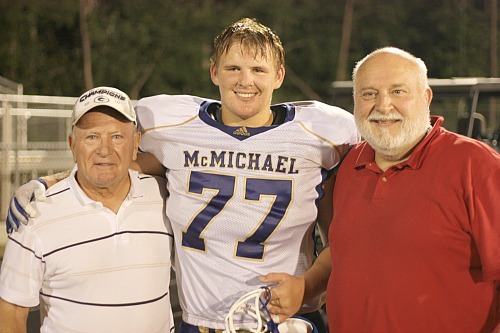 What an awesome photo of your son & his grandfathers… A total gift!! I had the most awesome grandparents and great grandparents too!! I knew most all of them well and mourned their passing, my last grandparent, my Mimi, in 2007. Though I was closest to my Mimi, I adored all of my grandparents & the stories they told & the traditions & wisdom they passed on to all of us that would listen.. Thanks for the reminder of Grandparents Day.. I should encourage my kids to put in a special call to all of their grandparents!! My own mother passed away 5 years ago, when my youngest child was only 4. She lived many miles from us, and when she was diagnosed with liver cancer, I had one major prayer, Lord give my children time to have a memory of their grandmother. Just this morning my daughter says to me “I use to love how your mom made toast not too crispy but not to chewy” I said to her, do you mean dad’s mom and she said “no your mom” . My mom made her toast the few mornings we visited one trip before she passed away, and she remembers. I couldn’t help but think what a testimony to “little things” making memories. If I could share as the grandparent……Things have changed in the past decades where grandparents or even parents of adult children are concerned. Not only are there many many miles separating them, but it seems that many if not most older parents/grandparents are expected to keep the relationship balls in the air. It is often left to them to travel, call, write etc with often little follow up from those they care most about. I know life has changed in many ways, but to keep relationships alive, it has to be a two way street. I wish I could say I am the only one in this place. I know many older people who long for connection, yet it is clear to them that they are not a priority.